Not long now before the gates open @EmiratesOT for this @NatWestT20Blast game! Toss is at 6pm, start 6.30pm. Lovely sunny evening ahead! At Grace Road, Leicestershire have won the toss and opted to bat against Worcestershire. Just five minutes until the first two matches of the night start. Both matches are now under way. After two overs Leicestershire (16-0) and Glamorgan (14-0) have each made decent starts to their innings. Glamorgan skipper Jim Allenby has already helped himself to two boundaries at Taunton. The Foxes move onto 32-0 after three overs when Josh Cobb smacks Jack Shantry for a six, a four and a six in consecutive balls. The opener has swiftly moved to 25 from 14 balls. [wicket]Cobb falls after adding just two more runs, Shantry gaining his revenge by catching him off the bowling of Chris Russell for 27. Niall O'Brien quickly gets to work by hitting a six three balls later to move Leicestershire to 43-1 in the fifth over. [wicket]Russell strikes again for Worcestershire. The seamer has now removed both openers after having O'Brien caught by Daryl Mitchell for 15 from 10 balls. The Foxes are now on 48-2 after six overs. Glamorgan are having no such problems at Taunton, with Allenby moving on to an unbeaten 41 as the visitors reach 56-0 after seven overs. Jacques Rudolph is still in the middle with Allenby having made a rather more subdued 18 from 19. They can't agree on a winner but Bumble & Vaughan are predicting sixes galore! [wicket]Greg Smith (24) and Ned Eckersley (24) had led the recovery for the Foxes until the former was removed at the end of the 11th over, caught and bowled by Mitchell. Then with the first ball of the next over Eckersley is removed! Mitchell again provides the catch but Colin Munro is the bowler this time. Leicestershire now 93-4. Allenby is still going strong for Glamorgan having reached his half-century . He is currently unbeaten on 56 with Glamorgan on 106-1 in the 14th over. Rudolph, however, has departed for 40. The countdown has finished and play is about to start. Tim Bresnan will bowl the first over for Yorkshire. Brooks gift Croft a boundary down the leg side with an ugly full toss and the singles and twos continue to flow for the following four balls. Another bad full toss is produced on the final ball and Croft again flicks it through leg side, this time for six! [wicket]Robinson is given the final over and sees Horton edge his second ball past Bairstow for four. The batsman also gets an outside edge on the next ball, but this time it clatters into his own stumps and he is bowled for 60. Robinson keeps it tight for the rest of the over, also bowling Jordan Clark with the last ball of the innings as the new batsman attempted a ramp shot. [end-of-innings]So Lancashire post a very competitive total after an incredibly fast start from Tom Smith and a fine knock from Paul Horton. They are probably the marginal favourites at the halfway point but with Aaron Finch firing the target is well within reach for the visitors. Durham have set a middling target of 146-7 from their 20 overs. John Hastings top-scored with 36 in the lower order while Boyd Rankin and Jeetan Patel both picked up two wickets. Surrey have also completed their innings. As we have already mentioned, Pietersen scored just five on his return to English domestic cricket, but Jason Roy (57) and Gary Wilson (45) helped the hosts to 151-6. Ravi Bopara was the pick of the bowlers with 2-24. Bopara sent this tweet to Pietersen earlier today. This evening he had Pietersen caught on the boundary with the first ball he bowled at the former England batsman. The chase in on at Old Trafford. Yorkshire need 180 to win. [wicket]There is a big shout first ball as Kabir Ali raps Andrew Gale on the pads, but it is turned down. Gale then gets off the mark after almost sending an inside edge onto his stumps to bring Finch on strike. He gets off the mark with a single and Ali then ends a fine first over by clattering the ball into the stumps of Gale (1). Finch blasts Junaid Khan through the covers for four but the seamer keeps it sensible for the rest of the over, conceding just two no ball and a single. The final result of the night is in: Gloucestershire have beaten Sussex by four runs after the latter side's chase fell short by four runs. Rory Hamilton-Brown scored 49 during the chase but Sussex were bowled out for 185 chasing 190. Graeme McCarter took 5-35 for Gloucestershire. 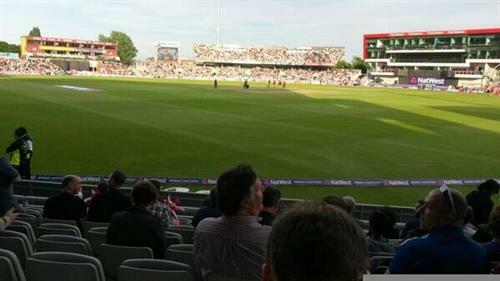 T20 at its best tonight @LancsCCC , I have seen the biggest 6 ever too from Finch . A treat for the full house at OT !